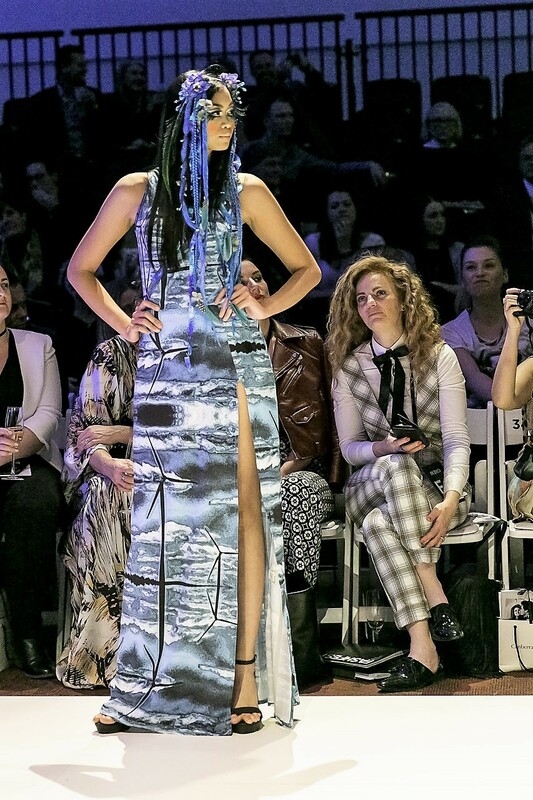 When designer Yumi Morrissey launched her Wind Turbine print on the catwalk at FASHFEST, she never imagined in her wildest dreams that the ACT Government would get wind of her work. 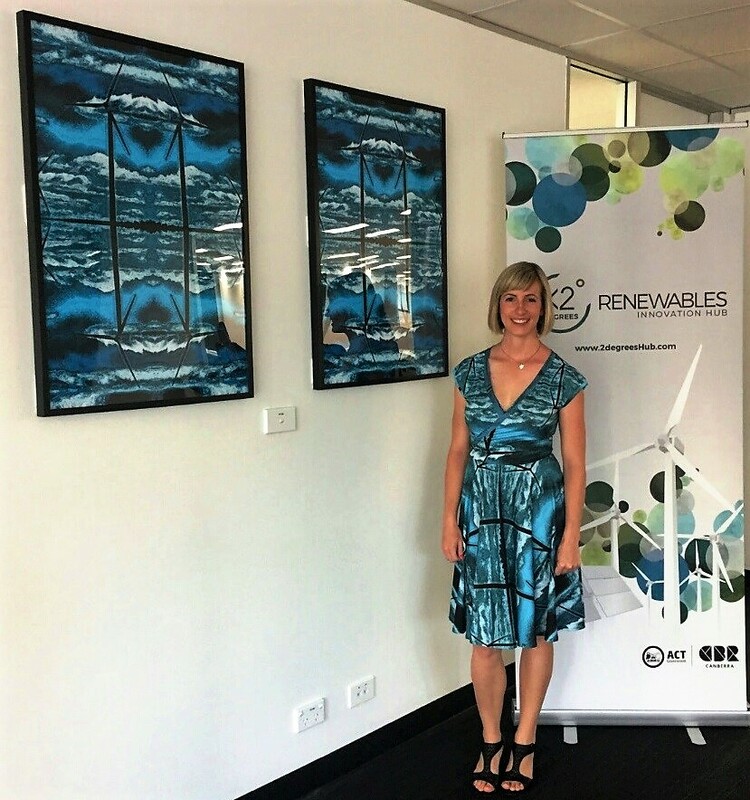 It did, and today two of Yumi’s prints are framed and hanging in Canberra’s brand new <2 degrees Renewable Innovation Hub. Over the past few years, Yumi has taken photos of her surrounds, manipulated them into prints, produced fabric, and then created garments under her fashion label Zilpah tart. This year, Yumi selected three photos, including the one she captured at Crookwell Wind Farm. The ACT Government approached the fashion designer to ask if they could frame the photo and hang it on the wall of the new Hub, launched just last week. It’s a perfect fit. Innovative design in a space devoted to innovation. The Hub is a collaborative co-working office space. Around 15 start ups and pioneering organisations working in the space are settling into the Hub, each contributing in their own way to the ACT’s renewable energy and cleantech sectors. It’s a new initiative of the Government, rolled out as part of its industry development strategy. 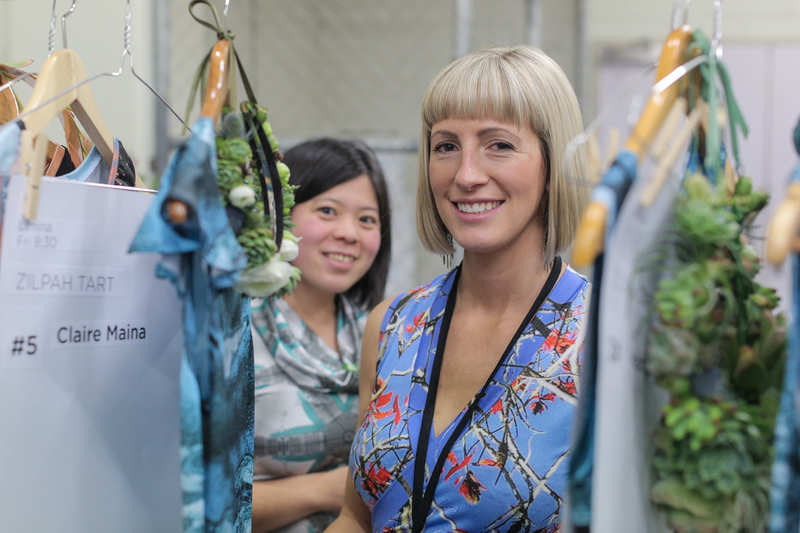 Yumi spoke at the launch, attended by more than 100 people, explaining how every year she creates new prints for the collections she launches at FASHFEST—Canberra’s largest red-carpet fashion event. For 2016, Yumi also created fabrics around a photo she took of a sunset from the steps of her home, and a photo she captured early morning at the Balloon Spectacular. Although Yumi captured the wine turbines for their unique beauty, she also was attracted to the importance they hold in our fight against climate change. Her print is likely the most newsworthy in town. 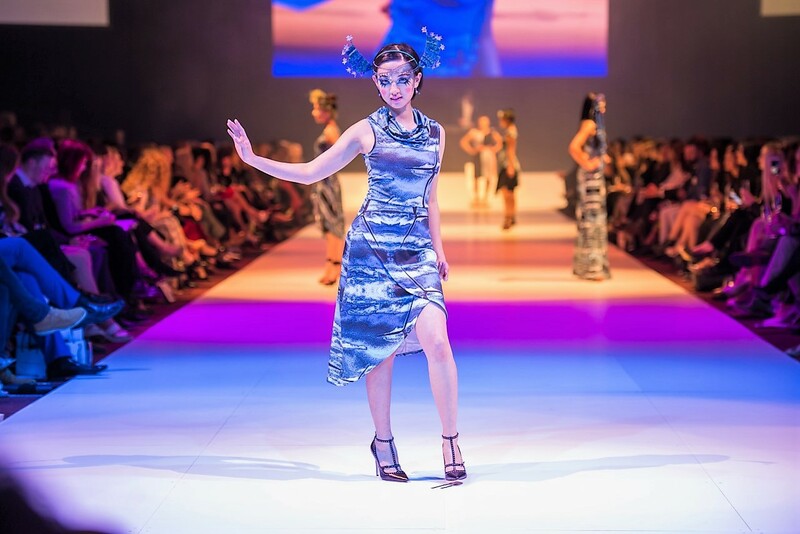 This entry was posted in LFW Your Canberra and tagged ACT Government, ACT Government Renewal Hub, Crookwell wind farm, FASHFEST 2016, PeonynPearl, Sparkling Weddings Photography, Zilpah Tart on November 30, 2016 by gracienumber1. I don’t know about you, but every once in a while I need a bit of a push to shift the way I move. Actually, sometimes a shove. A focus. A motivator. 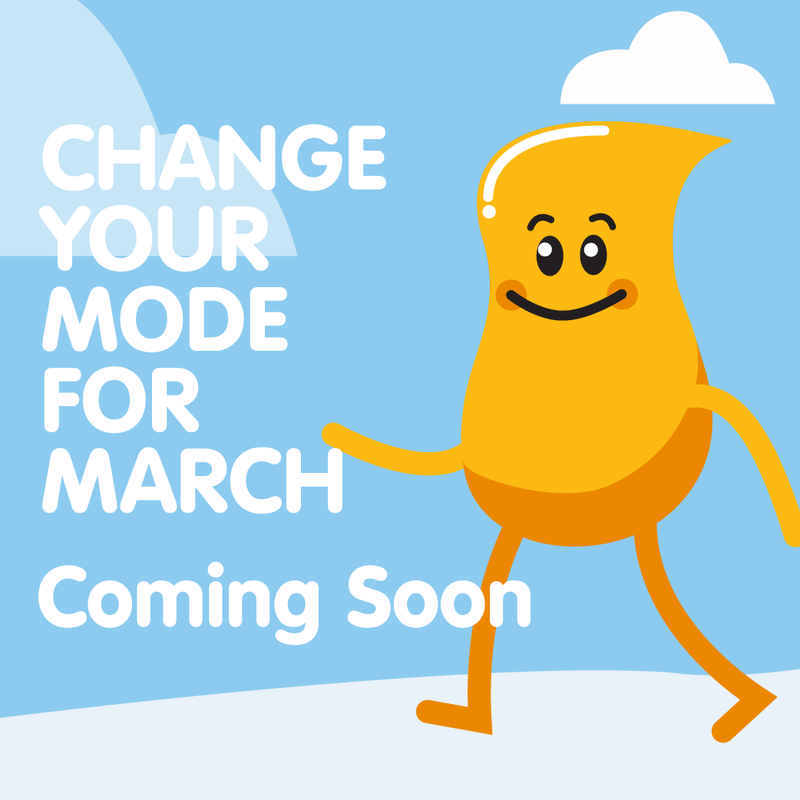 And a focus and motivator is exactly what the new ‘Change your mode for March’ challenge is all about. 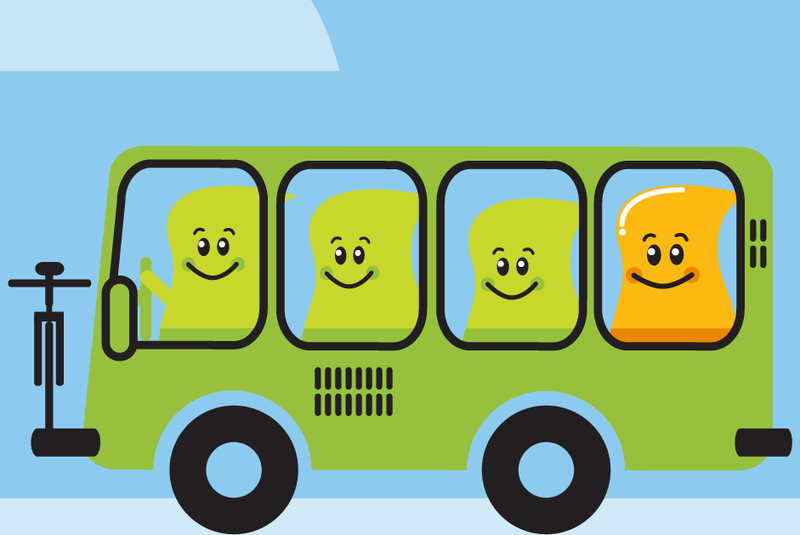 The brainchild of Actsmart, an online hub that helps us create a more sustainable future in the capital, ‘Change your mode for March’ challenges us to do our bit for the environment by parking our vehicles for 31 days and walking, cycling or taking a bus—to work, do chores, or socialise. Better still, the challenges help you in other ways—improve your health by being active, save money on petrol and parking (not to mention wear and tear on your vehicle), and help the environment by saving transport emissions. Before you scratch your head on the transport emissions bit, consider this. While the ACT is leading the nation and is on track to meet its 90 per cent renewable energy target by 2020, it needs to address emissions from the transport sector. That’s because transport is one of the highest emitters of greenhouse gases in Canberra. We need to get a handle on these nasty emissions before they get a handle on us, through traffic congestion, air pollution, and an even greater negative impact on climate change. And that includes the short trips so many of us make in our car, to pop to the shops, drop the kids off to a nearby school, or head to a destination that is literally around the corner. watch your progress on the leader board (you might even win one of the few prizes up for grabs). To take the challenge you absolutely must register by 5pm on 29 February. There are no restrictions on how much or little you do. If you can’t shift the way you move all 31 days in March, do as many as you can. 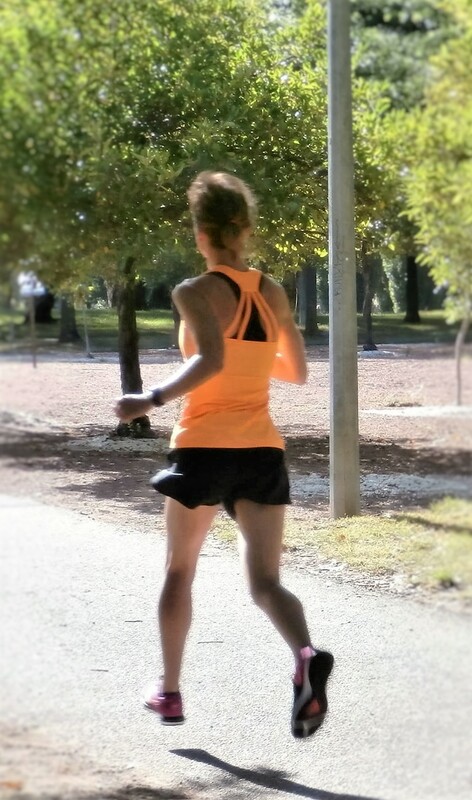 Any distance counts—1km, 2km, 3km or more. 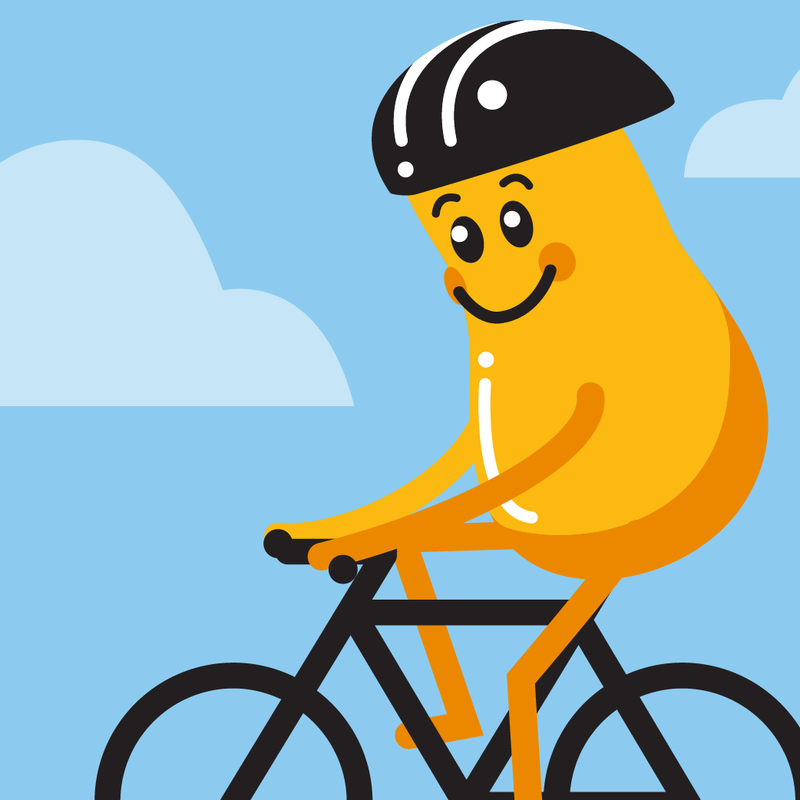 If you need free resources to help you plan, just head to www.actsmart.act.gov.au Actsmart will even guide you to a free walking and cycling map as well as to Park and Ride information, Bike and Ride information and a handy tracker called NXTBus which tells you where your bus is and when the next one will arrive. LFW is moving it in March—are you? This entry was posted in LFW Fit and Healthy and tagged ACT Fit, ACT Government, ACT Park and Ride, Actsmart, Canberra fitness on February 12, 2016 by gracienumber1.